"Security: Metadata & Operations Security"
I had the good fortune to address Phil Simon's class on how metadata influences security and data privacy. It also lead to this blog post on metadata related security issues the SAS website. "Applied Intelligence: Using Information That's Not There"
Organizations continue to unknowingly leak trade secrets on the Internet. To those in the know, these leaks are a valuable source of competitive intelligence. This talk describes how the speaker collects competitive intelligence for his own online retail business. Specifically, you learn how he combines, trends, and analyzes information within specific contexts to manufacture useful data that is real, but technically doesn't exist on it's own. For example, you will learn about the trade secrets that are hidden within sequential numbers, how he uses collected intelligence to procure inventory, and how and why he gauges the ongoing health of his industry and that of his competitors. And on a related note, you'll also learn how the federal government nearly exposed an entire generation to identity fraud. 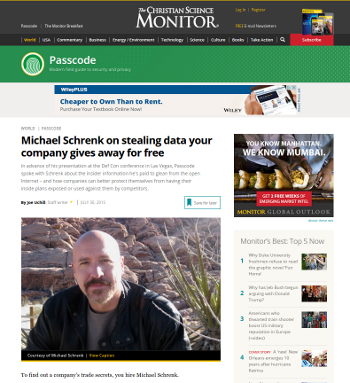 "Michael Schrenk on stealing data your company gives away for free"
In advance of his presentation at the Def Con conference in Las Vegas, Passcode spoke with Schrenk about the insider information he's paid to glean from the open Internet – and how companies can better protect themselves from having their inside plans exposed or used against them by competitors. "To find out a company's trade secrets, you hire Michael Schrenk." Networks don't need to be hacked for information to be compromised. This is particularly true for organizations that are trying to keep trade secrets. While we hear a lot about personal privacy, little is said in regard to organizational privacy. Organizations, in fact, leak information at a much greater rate than individuals, and usually do so with little fanfare. There are greater consequences for organizations when information is leaked because the secrets often fall into the hands of competitors. This talk uses a variety of real world examples to show how trade secrets are leaked online, and how organizational privacy is compromised by seemingly innocent use of The Internet. 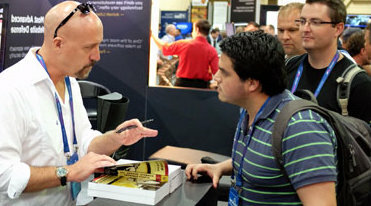 It was great meeting new and old readers at my two book signings at the BlackHat 2014 security conference at Mandalay Bay in Las Vegas. "Leaking Trade Secrets: A Conversation with Michael Schrenk" This interview was a lead-in to my talk at DEFCON XXII. "Leaking Trade Secrets: A Conversation with Michael Schrenk"
"How my Botnet Purchased Millions of Dollars in Cars and Defeated the Russian Hackers"
This is the true story of a botnet that created a competitive advantage for a car dealership. This dealership found a website that offered returned lease vehicles—great cars for their inventory—but bad web design and heavy competition from other automotive dealerships made the website useless. In response, a botnet was developed to make automotive purchases with machine precision. With the bot, they could acquire any cars they wanted, without interference from competing dealerships. 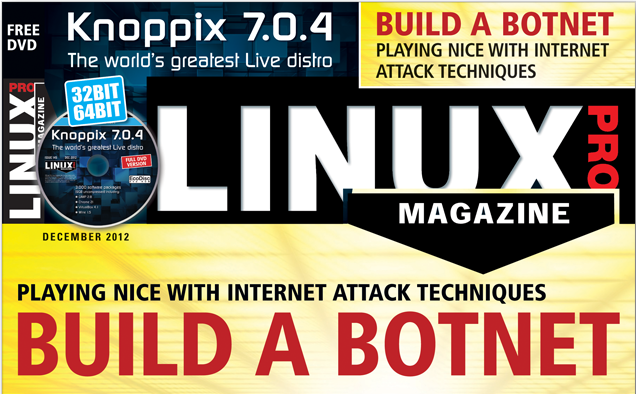 During its one-year life, this botnet autonomously acquired many millions of dollars in cars. Along the way, it successfully adjusted to competition from a similar bot developed by Russian hackers while maintaining a sufficiently low profile to "stay below the radar" of everyone involved. Las Vegas Grit is a pilot for a Las Vegas based television talk show. 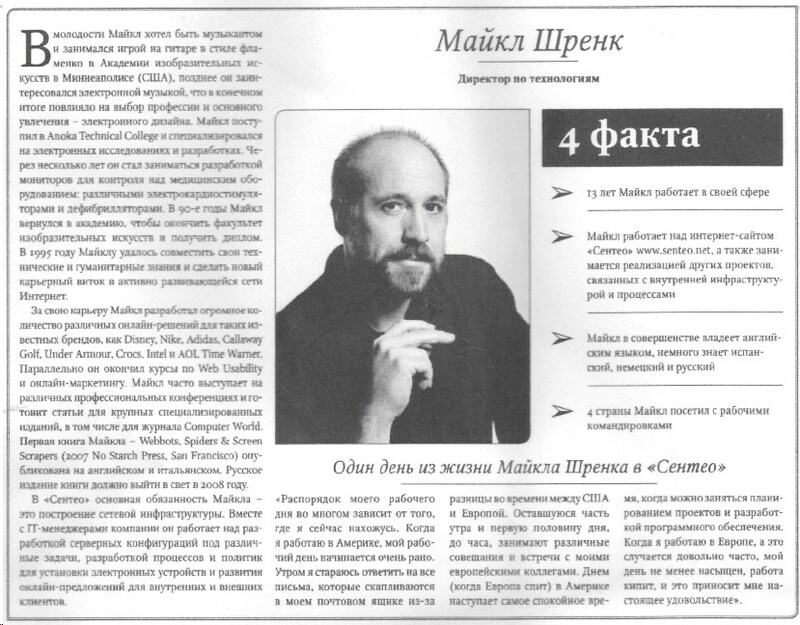 In my appearance, I talk about hacking, writing, future projects and living in Las Vegas. "Promote Your Career by Writing Non-Fiction"
Michael Schrenk describes how writing non-fiction can advance your a career. The primary focus on the talk was that the more transparency the writer has with the audience, the better the work. In other words, you'll be more successful when your personal reason for writing is in alignment with the topic. The second edition of this book is a major update of the first edition. "Webbots, Spiders, and Screen Scrapers"
This one-hour web cast was in anticipation of my upcoming book of the same title. 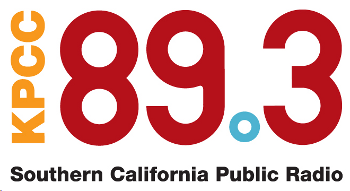 There were over 600 attendees in the live audience. This was the second of two interviews I did in one day for The British Broadcasting Corporation. This one was conducted live and for BBC World Service (radio). This was recorded interview conducted by BBC Radio in London. "The integrity of Software Developers"
I was part of a live panel discussion, where we discussed the integrity of so-called security providers and software developers. 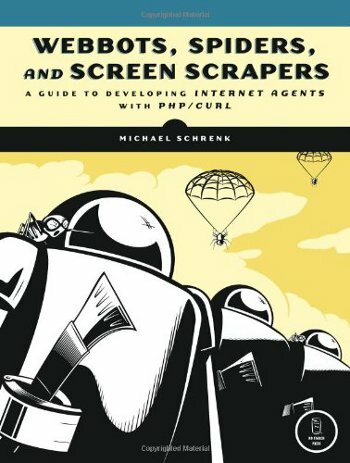 "Screen Scraper Tricks, Difficult Cases"
Screen scrapers and data mining bots often encounter problems when extracting data from modern websites. Obstacles like AJAX discourage many bot writers from completing screen scraping projects. The good news is that you can overcome most challenges if you learn a few tricks. This session describes the (sometimes mind numbing) roadblocks that can come between you and your ability to apply a screen scraper to a website. You'll discover simple techniques for extracting data from websites that freely employ DHTML, AJAX, complex cookie management as well as other techniques. 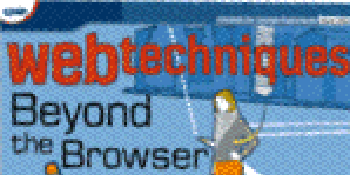 Additionally, you will also learn how "agencies" create large scale CAPTCHA solutions. All the tools discussed in this talk are available for free, offer complete customization and run on multiple platforms. You can watch Michael Schrenk's DEFCON 17 talk here. "Creating Competitive Advantages with Webbots"
Private Corporate Event, Zurich, Switzerland, Jul 2008 "Online Project Tracking"
Presented the plans and current status of a custom project tracking software use to track resources applied to projects and to calculate bonuses. In 2007 and 2008, I did a lot of work for Senteo, a company that consults to banks on creating customer experience. Most of the clients are banks in Eastern Europe. Private Corporate Event, Casa Blanca Morocco, Sep 2008 "Online Techniques for Distributed Organizations"
I presented on several techniques for organizations to connect with a distributed workforce. 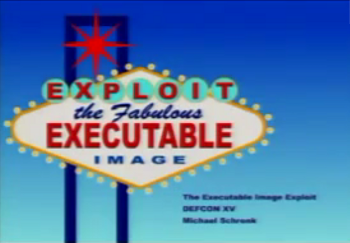 DEFCON XV, Las Vegas NV, Aug 2007 "The Executable Image Exploit"
This lecture described how to disguise computer programs as online images that may be used to gather specific metrics. I also talked about how these methods were used to help a Private Investigator track an online stalker. 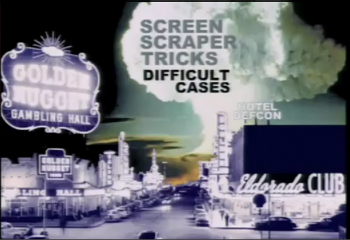 You can watch Michael Schrenk's DEFCON 15 talk here. 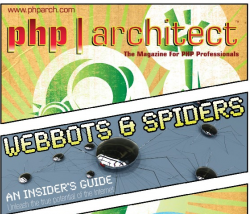 This presentation highlighted the benefits of writing webbots in PHP/CURL. In addition to explaining how to capitalize on flaws in the current client/server model used by the web, attention was paid to methods for downloading and parsing media. I was very proud that I went on directly after Rasmus Lerdorf, who got the PHP project off the ground in 1995. In this presentation, I enlarged on the previous year's pretension to show how automation can improve Corporate Competitive Intelligence. "An Introduction to Writing Webbots and Spiders"
You can have a lot of fun with the Internet by ditching your browser in favor of writing special purpose programs that look for or do very specific things on the Internet. This session will equip you with techniques to extract and interact with data from web sites without a browser, parse and filter data, follow links, deal with encryption and passwords, and manage terabytes of information. You'll also learn why writing these programs is a useful activity, and walk away with ideas and abilities to write useful spiders or web agents of your own design. Follow the link for more information on Michael Schrenk's DEFCON 10 Talk.